Many motorcyclists in Chicago, Illinois, take safety precautions because they know they risk serious physical harm if they are involved in accidents. Unfortunately, these efforts cannot protect motorcyclists against preventable accidents caused by other drivers, which represent a substantial portion of all motorcycle accidents. Research indicates that failure to yield on the part of other motorists is a factor in over one-third of motorcycle accidents. Nine out of ten motorcycle fatalities occurred in crashes with passenger vehicles. Motorcyclists struck passenger vehicles in nearly 75 percent of these crashes. Out of all the accidents passenger vehicle drivers caused or contributed to, 35 percent involved failure to yield. In 2013, the Florida Department of Transportation reported similar findings. Passenger vehicle drivers were at fault in 60 percent of the motorcycle accidents that occurred over a 10-year period. Frequently, passenger vehicle drivers made left turns, pulling in front of motorcycles traveling in a straight path. According to Florida’s Sun-Sentinel, researchers suggest this occurs because motorists have trouble judging motorcycle travel speed or even noticing when motorcycles are nearby. Illinois motorcyclists face similar safety risks. Illinois Crash Data, a report of state crashes from 2007 to 2011, states more than half of motorcyclists were traveling in a straight line at the time a crash occurred. The issue of drivers failing to yield was illustrated by a motorcycle accident that occurred near Crystal Lake in June. According to Chicago’s Daily Herald, a dump truck failed to yield and turned left in front of a motorcycle, leaving the motorcyclist injured. In two-vehicle crashes, motorcyclists are more likely to be severely or fatally injured than passenger vehicle occupants. The NHTSA reports passenger vehicle occupants represent just 2 percent of fatalities in motorcycle accidents. 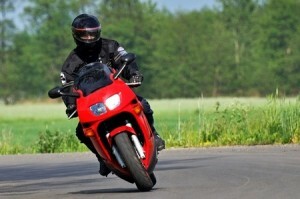 Motorcyclists face a higher risk of serious injury because they are so exposed. The Centers for Disease Control and Prevention reports one-fifth of motorcycle accidents involve head or neck injuries. These injuries can result in irreversible and even crippling conditions, such as traumatic brain injury or paralysis. Given the severity of the injuries motorcyclists may sustain, it is crucial for accident victims to obtain compensation whenever possible. If a passenger vehicle driver failed to yield or otherwise violated a traffic law, he or she may be held liable for the resulting accident. When the injuries arising from an accident are serious, costly or otherwise life-changing, motorcyclists should consider meeting with an attorney to improve their likelihood of making a successful claim.